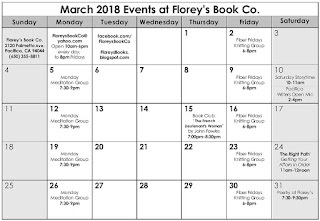 March 2018 Events at Florey's Book Co.
February 2018 Poetry at Florey's. 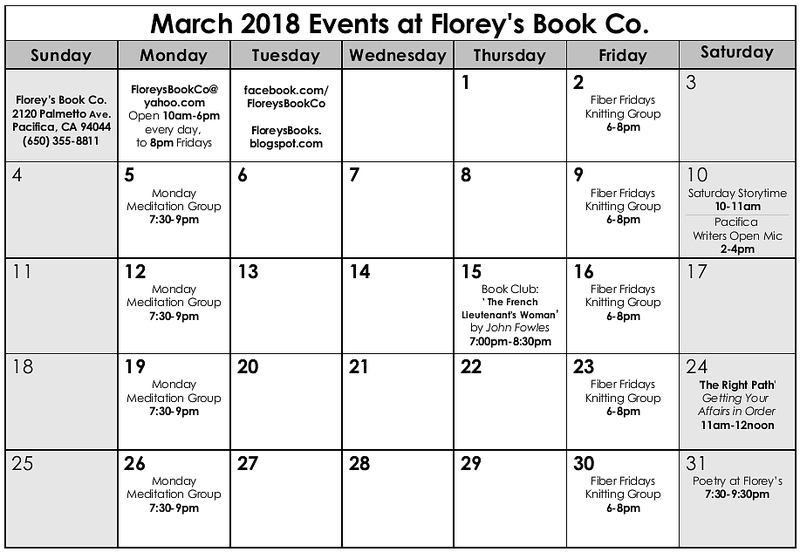 The featured poets this month are Karen Llagas and Florencia Milito. I'd like to invite you to consider joining Aaron and me for our poetry reading later this month. We'll be featuring poets Karen Llagas and Florencia Milito for their poetic view on the world. As always, you are invited to bring your own work to read at open mic (3 minutes, please, and do time yourselves so you can observe the time limit); our open mics are among the most varied, high quality and courteous I've observed! If you can, please also bring a snack or drink to share (water is particularly appreciated). We now have plenty of napkins, plates, and other supplies, thanks to you! Born in Argentina, Florencia Milito spent her early childhood in Venezuela and has lived in the U.S. since she was nine. She is a bilingual poet, essayist, and translator whose work has appeared in ZYZZYVA; Indiana Review; Catamaran; Entremares; Digging through the Fat; Diálogo; 92nd Street Y; Kenyon Review; and Latina Voices, Protest, and Struggle in 21st Century USA. A Hedgebrook alumna, CantoMundo fellow, and San Francisco Grotto fellow, she lives in San Francisco and works as a translator and teaching artist. 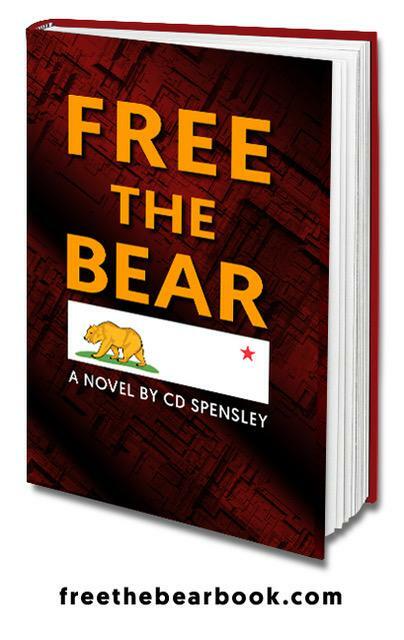 'Free the Bear' Book Event with Author CD Spensley, Feb. 24th at Florey's! Florey's Books welcomes local author CD Spensley as they discusses their new novel, "Free the Bear". 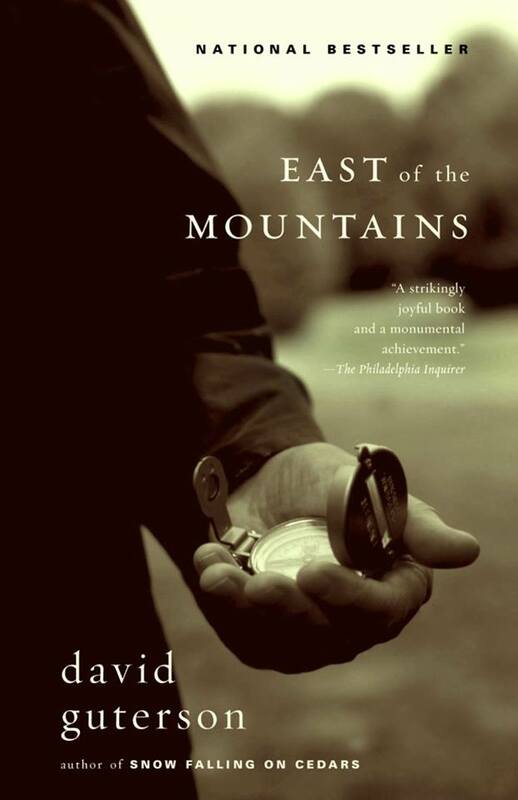 Florey's Book Club: 'East of the Mountains' February 15th! Come by for a chat about our February book, 'East of the Mountains' by David Guterson. It is mid-October, 1997, harvest time in the Columbia Basin of central Washington state, a rich apple- and pear-growing region. Ben Givens, recently widowed, is a retired heart surgeon, once admired for his steadiness of hand, his precision, his endurance. He has terminal colon cancer. While Ben does not readily accept defeat, he is determined to avoid suffering rather than engage it. And so, accompanied by his two hunting dogs, he sets out through the mythic American West-sage deserts, yawning canyons, dusty ranches, vast orchards-on his last hunt. The main issues for Ben as a doctor had been tactical and so it would be with his death. But he hadn't considered the persuasiveness of memory-the promise he made to his wife Rachel, the love of his life, during World War II. Or life's mystery. On his journey he meets a young couple who are "forever," a drifter offering left-handed advice that might lessen the pain, a veterinarian with a touch only a heart surgeon would recognize, a rancher bent on destruction, a migrant worker who tests Ben's ability to understand. And just when he thinks there is no turning back, nothing to lose that wasn't lost, his power of intervention is called upon and his very identity tested. Full of humanity, passion, and moral honesty, East of the Mountains is a bold and beautiful novel of personal discovery. David Guterson is the author of a collection of short stories, The Country Ahead of Us, the Country Behind; Family Matters: Why Homeschooling Makes Sense; Snow Falling on Cedars, which won the 1995 PEN/Faulkner Award, the Pacific Northwest Bookseller Association Award, and was an international bestseller; and the national bestseller East of the Mountains. 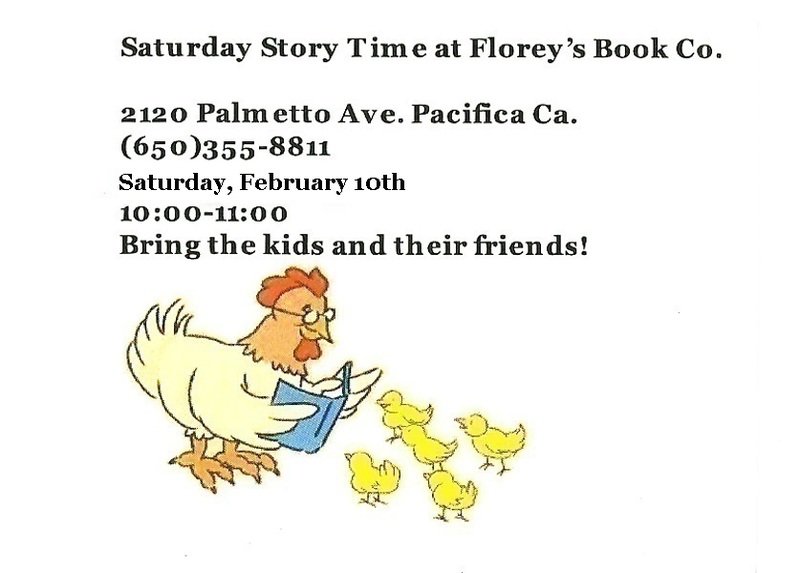 Two-Book Event with Author Michael Romano, Feb.11th at Florey's! 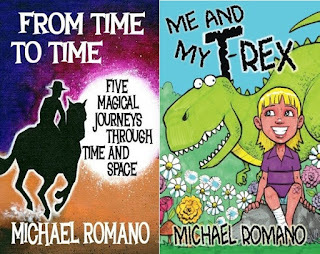 Florey's Books welcomes local author Michael Romano as he discusses his new books, "From Time to Time" & "Me and My T-Rex". Come along on an amazing journey that crosses space and time! Michael Romano presents five personal and fantastical stories linked by larger-than-life characters, and time-bending magic! 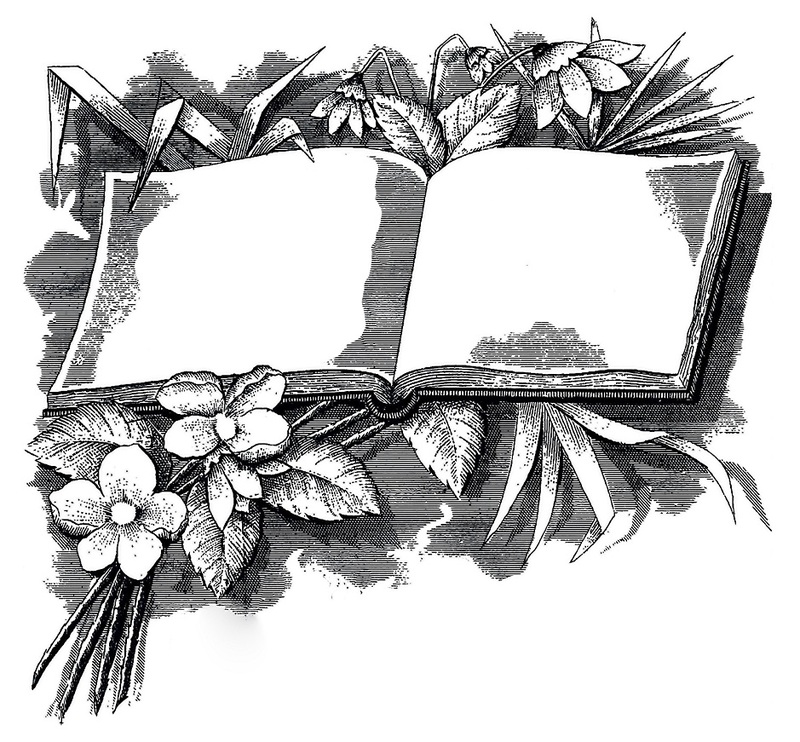 From the old west to the far-flung future, these are five tales you will never forget! Olivia's dad is a paleontologist, which means another boring summer of digging for dinosaur bones. She finds more adventure than she bargained for when she discovers what appears to be a large dino egg! And it appears to be hatching! 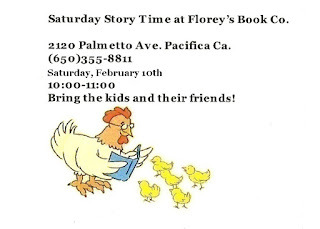 Writers Open Mic, February 10th at Florey's!